An excellent breathing regulator that is compact and lightweight. The ATX40 Octopus is the same in spec to the ATX40 second stage but comes with bright highly visible front cover. The ATX40 stage 3 regulator set is made complete with the DS4 first stage, the benchmark in first stage reliability and simplicity. 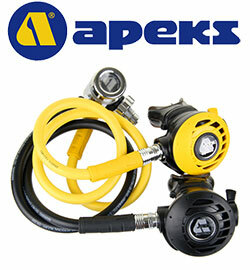 Highly visible with bright yellow front cover, accent pieces and supplied 36" yellow hose.